Also this, from the “I was busy last night and missed it” file: Doug Slaten and Chris Leroux both cleared waivers and were outrighted to AAA. Either would have to be readded to the 40 man roster to be called back to the active major league roster. 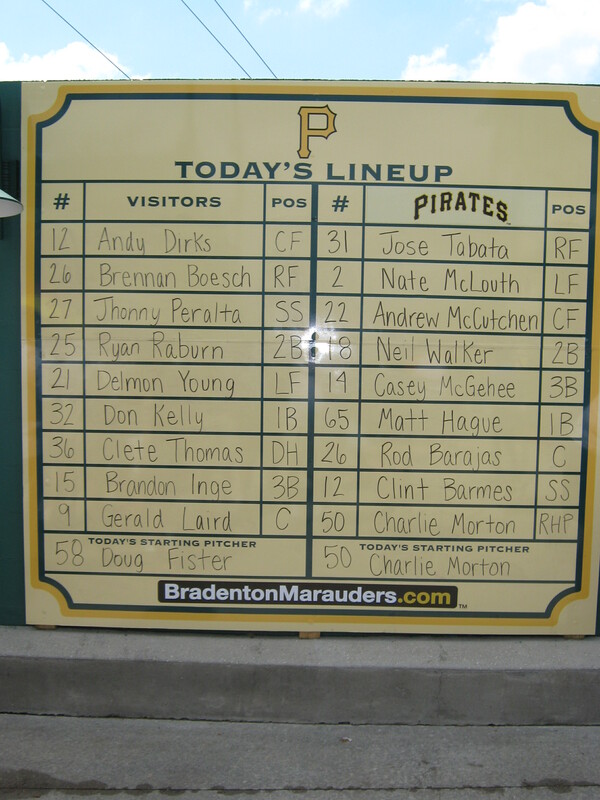 The Pirates made their final roster moves yesterday, putting Chris Leroux, Charlie Morton and A.J. Burnett on the Disabled List and adding Juan Cruz to the 40-man roster. Here’s the to current roster for today’s 1:35 game vs. the Phillies. In honor of the best day of the year, I updated last year’s Whole Team Trade Tree to show how this current squad was built. (Click to embiggen.) Now play ball! 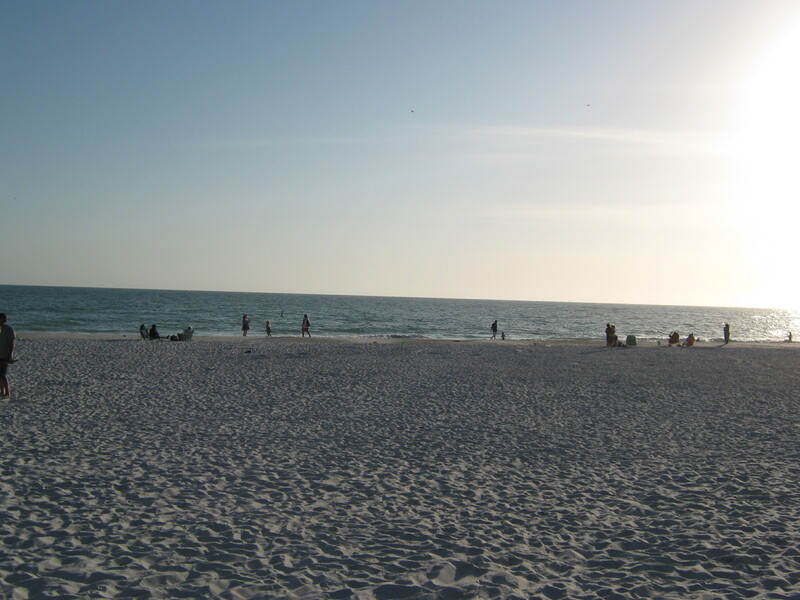 If you missed it, check out Part 1: Pirate City. 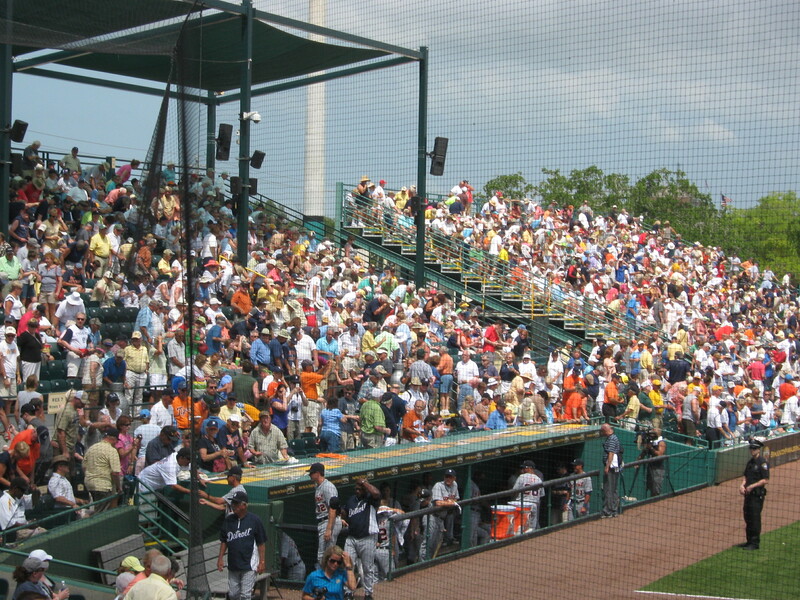 As I walked into McKechnie I got word that Pedro Alvarez was in the batting cage. 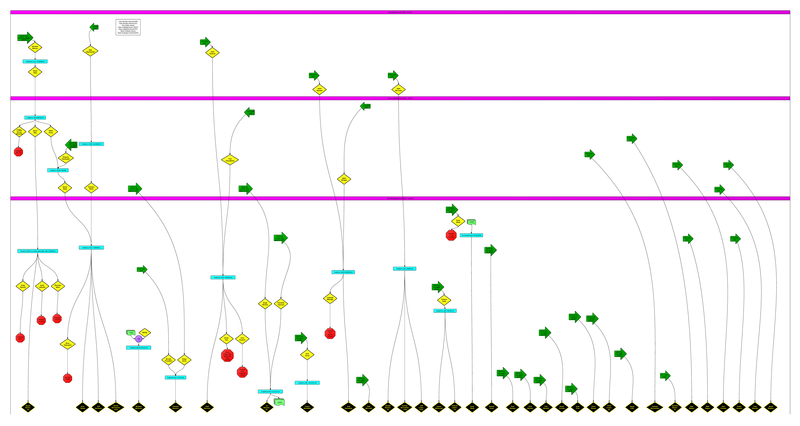 This is five shots of five different swings I’ve put together in a gif. Pedro looked to be swinging well and the ball had a good sound coming off of his bat. The coach pitching to him was having him work on staying back. This was bout two hours before news broke that Alvarez has discomfort in his knee and will be held out for a few games. As you can see he’s not wearing a brace and I saw no sign of a limp. But as someone who has some knee issues of my own, I can say that certain movements trigger the pain more than others. It may be an issue where he can’t run or field as well as he needs to but swinging does no harm. On to the game. Recap. Box Score. Pictures at the bottom. Good: Charlie Morton was lights out. 4 IP, 2 H, 2 K. Mostly groundballs. I’ll have more on him below. Matt Hague continued to look strong in his bid to make the big league club both at bat (2 run HR) and in the field (nice pick of a throw in the dirt.) Jose Tabata went 3-4. Up and Down: Casey McGehee booted one easy grounder but made a nice play later on one which was hit harder. No hits fell in for him but he hit the ball square each time. Rod Barajas went 0-3 but had a good throw to catch Georgia Tech alum Tony Plagman stealing. 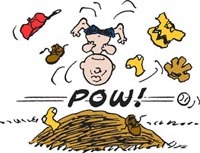 Nearly Bad: Chris Leroux got Charlie Brown’d during his one inning. A line drive had him duck so fast his hat came off. Luckily he wasn’t hit or hurt and finished the inning without incident. Just Bad: Daniel McCutchen was more unlucky than anything else. Most of the hits he gave up were soft ground balls that just eluded the defense. However, the grand slam was a no-doubter to centerfield. After the game I was able to briefly speak with Pirates General Manager Neal Huntington. I asked him about Morton not being named to the rotation for the opening week in contrast with his stellar outing today, and if it was just a matter of getting him stretched out. I didn’t have a recorder so I’ll paraphrase in an attempt not to misquote Mr. Huntington. The team is in a fortunate position in that the schedule allows them to “find out where he is” and take the time to make sure Charlie is healthy and ready to go without rushing him. In a similar situation last year with James McDonald, James came back too quickly to start the year and ended up not performing well in April. Barring any new developments, my gut says to look for Charlie on the 14th. Many thanks to Mr. Huntington for his time and words. Morton doing long toss while Barajas stretches. 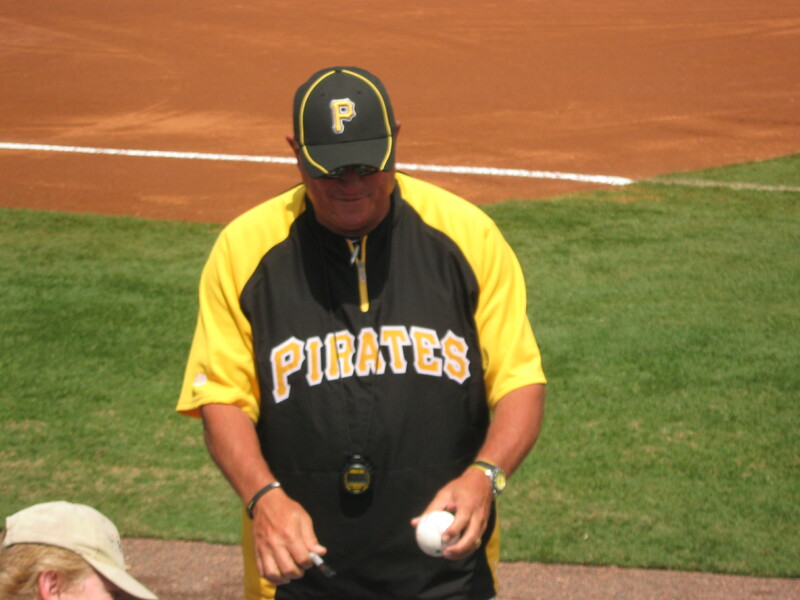 Clint Hurdle signs an autograph. 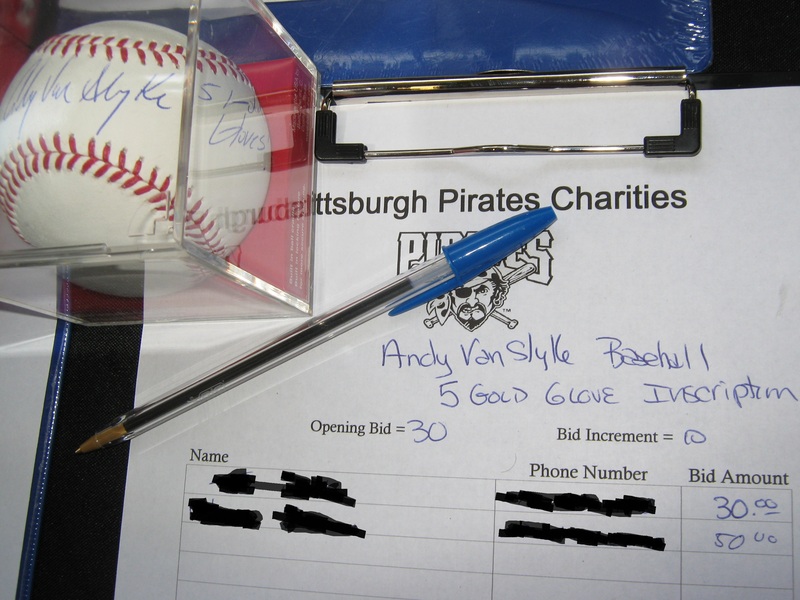 Just for Pat at WHYGAVS, a signed Andy Van Slyke ball that was up for auction. 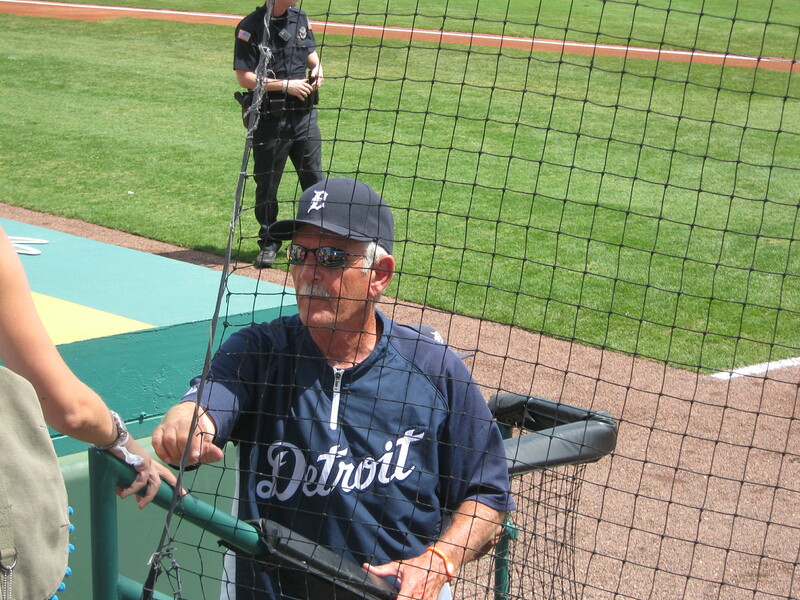 Former Pirates' manager Jim Leyland. 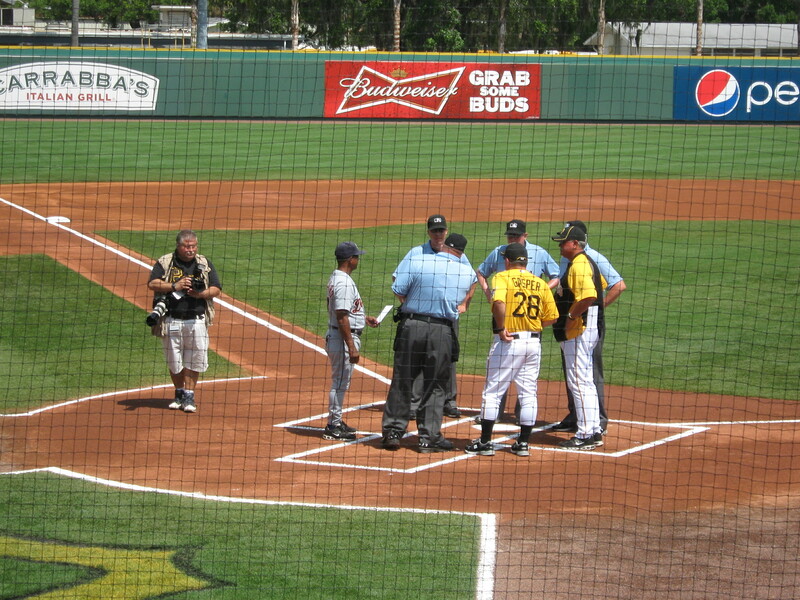 Former Pirate Rafael Belliard took out the lineup card. 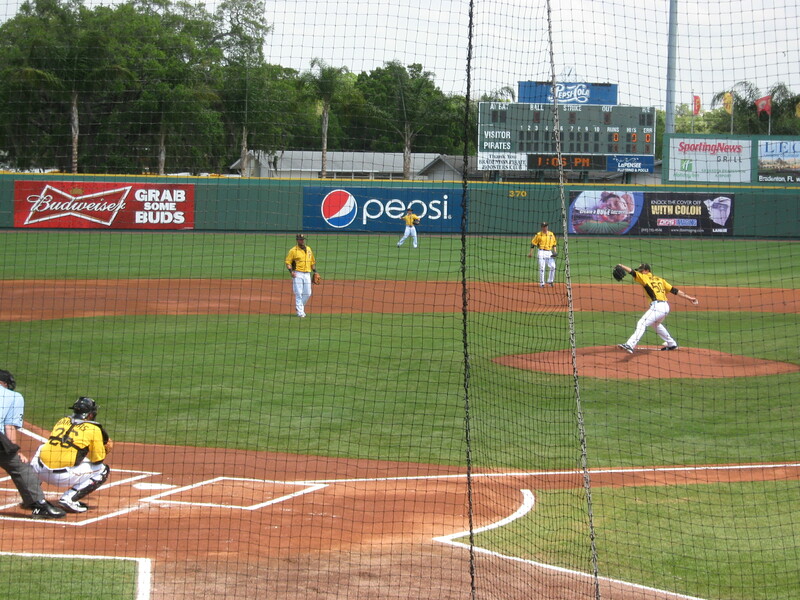 Morton throws a warmup pitch. Dinner was a nice piece of grouper with a baked potato and a Maker's and Coke. Oh, and this great view. Tomorrow: Last day. Probably go to Pirate City and see if A.J. Burnett will be throwing his simulated game there.